Some WordPress users believe that WordPress’ biggest downfall is a lack of visual or WYSIWYG editor. There are various third party themes and plugins that have tried to fill that gap in the past. However, if you want to use only the WordPress editor, it requires some CSS and HTML knowledge to ‘design’ the layout of a page. Gutenberg is WordPress’ attempt to change that. Johannes Gutenberg introduced the printing press to Europe in the 1500s. He was also the first European to use moveable type. His printing process allowed for affordable mass production of books and printed materials. A hobby that was previously reserved for the wealthy became accessible to everyone. You can see why WordPress chose to name their editor after him. The current WordPress editor is a basically a text editor. Though it can be greatly extended with the use of plugins, on its own, it is fairly limited. For more information on blocks, see the live Gutenberg demo. In theory, you’ll be able to drag and arrange these blocks into your desired layout. 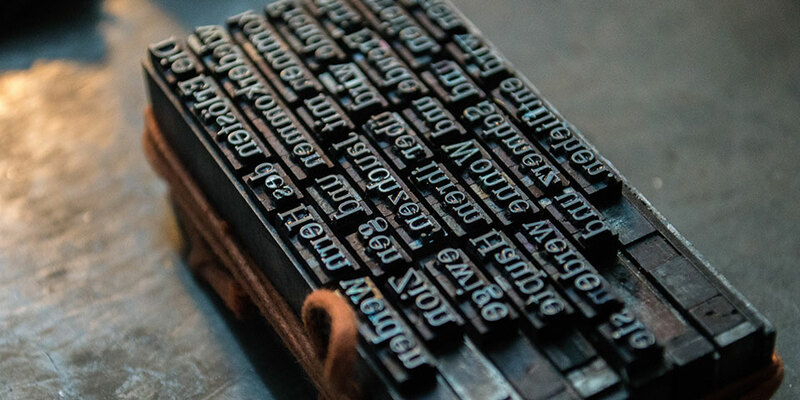 How will Gutenberg integrate into WordPress? Gutenberg is currently available as a plugin. It will soon integrate directly into WordPress core, beginning with WordPress 5.0. While there is no set date for 5.0’s release, it will most likely happen in the next month or so. Is there a way to test Gutenberg before it becomes part of WordPress core? You can download and install the Gutenberg plugin from the WordPress plugin repository. This will allow you to test it with your current theme and site. One nice thing about Gutenberg is that unlike many other page editors, it does not break your site when deactivated. This is due to the fact that it doesn’t rely on shortcodes to build the page layout. 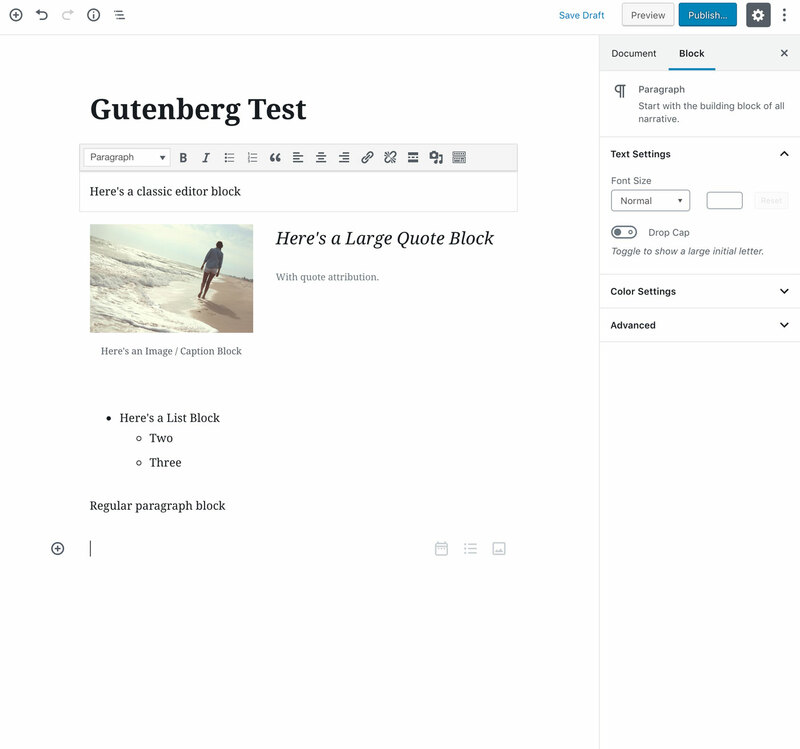 So, you can toggle back and forth between the Gutenberg editor, and the current page editor. What if I don’t like Gutenberg? A quick Google search or read of the plugin’s reviews will reveal that a lot of folks are pushing back on Gutenberg. This is part of the reason its release date is not yet final. If you would like to prevent Gutenberg from becoming the default editor when WordPress 5.0 releases, you can download the Classic Editor. The Classic Editor is a plugin that forces the current TinyMCE editor to remain active. WordPress has recently announced that the Classic Editor plugin will be officially supported until at least 2022. What does Gutenberg mean for AudioTheme products? Several of you have contacted us asking if you need to do anything to prepare for Gutenberg. 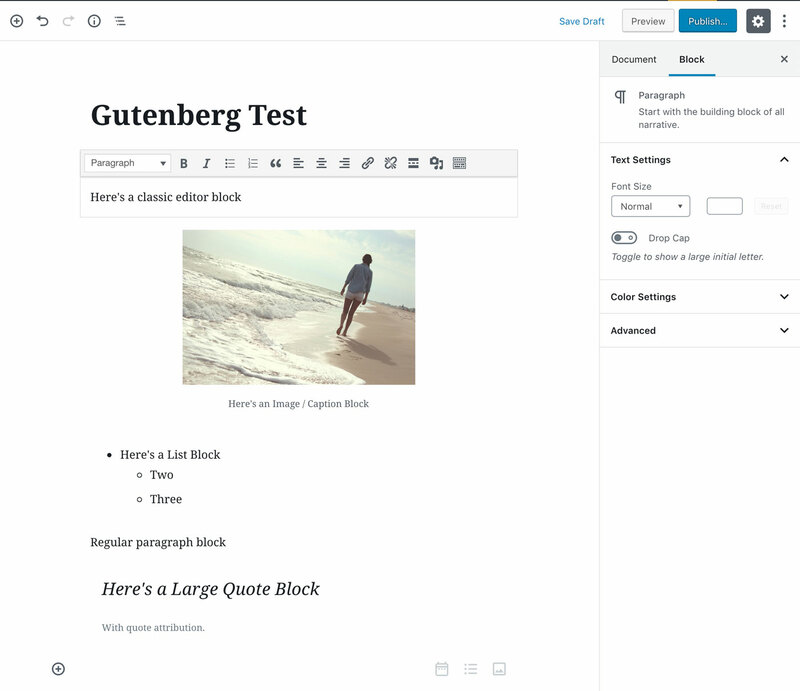 If you’re a fan, you won’t have any trouble using the Gutenberg editor with our themes. If you’d prefer to stick with the current editor, you just need to download the Classic Editor plugin. We do have plans to create some custom blocks for Gutenberg as it becomes more stable. For now, we recommend you give it a whirl by using the plugin. We’re interested to hear what you think! I interested in being able to edit AudioTheme pages such as the gig list and gig pages where images included and the order of dates and maps etc. Thank you for this brief post that lets us know that AudioTheme is thinking about Gutenberg. Looking forward to more.